A large number of complaints from the OFWs and their families about lost packages surfaced last year. Some of the packages reached their destinations but the boxes are either altered or broken and with missing contents. Some of them never reached the recipients. 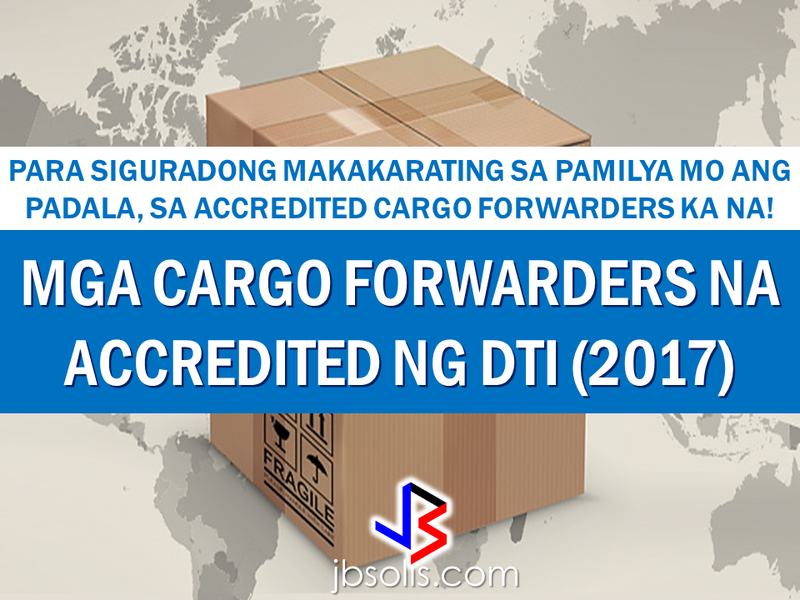 The Bureau of Customs recently issued suspension orders and delisted a lot of cargo forwarders and brokers for non-compliance of the law. 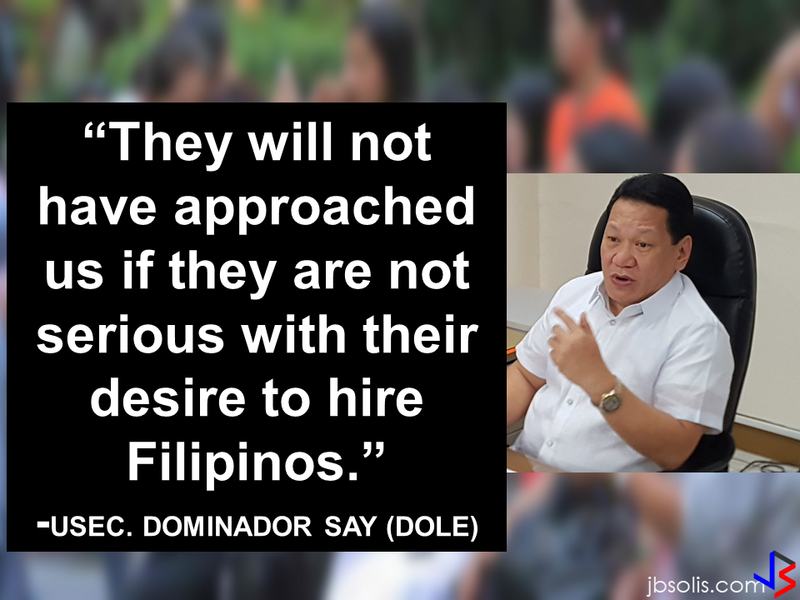 Most of them are also under investigation by the bureau. Avoid being victimized by bogus cargo companies. To make sure that your family receives all your hard-earned packages, transact only with the DTI accredited cargo companies in your host country. We-Go Logistics Int'l. Corp. We-Go Logistics Int'l. Corp.
Nippon Express Philippines Corporation Nippon Express (Australia) Pty.,Ltd. Vienna 12:24 Cargo Express Corporation M&M Cargo Express E.U. Belgium Nippon Express Philippines Corporation Nippon Express (Belgium) N.V./S.A. Brazil Sao Paolo Nippon Express Philippines Corporation Nippon Express do Brasil Ltda. British Columbia 12:24 Cargo Express Corporation Forex Cargo (BC) INC.
Edmonton Willxpress, Inc. (formerly Accord Freightforwarders, Inc.) Forex Alliance Cargo Forwarder Inc.
Ontario Nippon Express Philippines Corporation Nippon Express Canada Ltd.
Richmond R & A Fastfrate Corp. Star Box Express Inc.
Chile Santiago Nippon Express Philippines Corporation Nippon Express Chile S.A.
China Huangou We-Go Logistics Int'l. Corp. We-Go Logistics Int'l. Corp.
Ningbo We-Go Logistics Int'l. Corp. We-Go Logistics Int'l. Corp.
Shanghai Jeezan Int'l Cargo & Courier Services Shanghai Galaxy International Logistics Co., Ltd.
Unified Alliance Asia Logistics Phils. Inc. Shanghai Viewtrans Co., Ltd.
Shekou We-Go Logistics Int'l. Corp. We-Go Logistics Int'l. Corp.
Tianjin Fast-Tract Freight Phils., Inc. Tianwoo Logistics Dev.Co.,Ltd. Xingang We-Go Logistics Int'l. Corp. We-Go Logistics Int'l. Corp.
Czech Republic Prague Speedmark Philippines, Inc Speedmark Transportation Ltd c/o Maurice Ward & Co. s.r.o. France Le Harve Nippon Express Philippines Corporation Nippon Express France S.A.
Hong Kong Hong Kong Afreight Phils., Inc. Afreight (Asia - Pacific) Ltd.
Genex Cargo Forwarder General Cargo Express Ltd.
Nippon Express Philippines Corporation Nippon Express (Hkg) Co.,Ltd. Unified Alliance Asia Logistics Phils. Inc. Golden Wave Shipping Ltd.
Nippon Express Philippines Corporation Nippon Express (Ireland) Ltd.
Dundalk 12:24 Cargo Express Corporation Balikbayan Box, Inc.
Fast-Tract Freight Phils., Inc. Francesco Paris S.PA. Nippon Express Philippines Corporation Nippon Express (Italia) S.R.L. Milano Nippon Express Philippines Corporation Nippon Express (Italia) S.R.L. Kobe Nippon Express Philippines Corporation Nippon Express Co.,Ltd. Maizuro-Shi Chenvel Svcs., Inc. Global Cargo Int'l. Nippon Express Philippines Corporation Nippon Express Co.,Ltd. Osaka Nippon Express Philippines Corporation Nippon Express Co.,Ltd. Tokyo Nippon Express Philippines Corporation Nippon Express Co.,Ltd. Speedmark Philippines, Inc Mitsui Soko Air Cargo Inc.
Korea Busan Fast-Tract Freight Phils., Inc. Daewon Logipia Co.,Ltd. Speedmark Philippines, Inc SMT Speed-Mark Forwarders (M) SDN. BHD. Mexico Manzanillo Nippon Express Philippines Corporation Nippon Express de Mexico S.A. de C.V.
Myanmar Yangon Speedmark Philippines, Inc Myanmar Speedmark Transportation Ltd.
Netherlands Amsterdam Speedmark Philippines, Inc Speedmark Transportatio B.V.
Nippon Express Philippines Corporation Nippon Express (Nederland) B.V.
Papua New Guinea Port Moresby Manilaforwarder Phil., Inc. Pearl Express Ltd.
Portugal Portugal Nippon Express Philippines Corporation Nippon Express Portugal S.A.
Sky Land Global Logistics, Inc.
Sky Land Brokerage Inc. Kamal Hassan Al Wassia Est. Brand Expert Freight Forwarder, Corp. KC Dat Balikbayan Express Pte Ltd.
Fast-Tract Freight Phils., Inc. Metier Express Line Pte Ltd.
GCLPI-Gateway Container Line Phils., Inc. Benkel International Pte Ltd.
Jolly-B Box Express Line, Inc. JBB Groupage Pte Ltd.
Nippon Express Philippines Corporation Nippon Express (Sin) Pte.,Ltd. Valu-Kargo Line, Inc. Valukargo Groupage Services Inc.
Barcelona Nippon Express Philippines Corporation Nippon Express de Espana S.A. Urgent Cargo Express Int'l. Forwarder & Brokerage Inc. Air Asia Str. Keelung Nippon Express Philippines Corporation Nippon Express (Taiwan) Co.,Ltd. Thailand Bangkok Nippon Express Philippines Corporation Nippon Express (Thailand) Co.,Ltd. Speedmark Philippines, Inc Latek Lojistik TIC A.S.
Mar Freight Forwarding Services Crystal International Cargo L.L.C. Nippon Express Philippines Corporation Nippon Express (Middle East) L.L.C. United Kingdom London E-pad Freight Forwarder Highlight Express Int'l. Highlights Express Air and Ocean Cargo, Co. Highlights Express International Ltd.
Southampton Nippon Express Philippines Corporation Nippon Express (UK) Ltd.
United States of America Atlanta Nippon Express Philippines Corporation Nippon Express U.S.A. Inc. Brand Expert Freight Forwarder, Corp. Mon Cargo Services Inc.
Wide-Wide World Express Corporation (formerly DHL (Philippines) Services Corporation) MGL (USA) Inc.
Nippon Express Philippines Corporation Nippon Express U.S.A. Inc.
Detroit Nippon Express Philippines Corporation Nippon Express U.S.A. Inc.
Hawaii U MAC Forwarders Express, Inc. Hi-Phil Express, Inc.
Houston Nippon Express Philippines Corporation Nippon Express U.S.A. Inc.
Nashville Nippon Express Philippines Corporation Nippon Express U.S.A. Inc.
New York Abbraj Cargo Express Macro-Graphics International Corp.
Virginia Mariano F. Castro & Sons, Inc. Manila Forwarders Corp.
Washington Willex Movers, Inc. Willex USA Cargo Inc.
Vietnam Ho Chi Minh City Fast-Tract Freight Phils., Inc. T..V.L. Global Logistics (Vietnam) Co.,Ltd. Nippon Express Philippines Corporation Nippon Express (Vietnam) Co.,Ltd. Vietnam Unified Alliance Asia Logistics Phils. Inc. Almighty Co., Ltd.